Roger Ebert: 'Waltz with Bashir" is a devastating animated film that tries to reconstruct how and why thousands of innocent civilians were massacred because those with the power to stop them took no action. Why they did not act is hard to say. Did they not see? Not realize? Not draw fateful conclusions? In any event, at the film's end, the animation gives way to newsreel footage of the dead, whose death is inescapable. The massacre, well documented, took place during Israel's 1982 invasion of Lebanon. The victims were in Palestinian refugee camps. They were killed by a Christian militia. Israelis were in nominal control of the militia, but did not stop the massacre. Blame has never been clearly assigned. Certainly the Christians pulling the triggers were guilty. Were the Israelis enablers? NPR: These are real stories, told in voiceover by the participants. (Usually: In two cases, an actor recited the text because a narrator didn't want his voice in the film.) The anecdotes may not all be literally true, but they certainly haven't been sanitized, and some of them are supported by multiple accounts. The episodes are mostly accompanied by stark, neoclassical music, occasionally punctuated by the cold sounds of '80s British art-pop. Public Image Limited's "This is Not a Love Song" underscores a soldier's tale of alienation while on furlough in a war-ignoring Israel; Orchestral Manoeuvres in the Dark's "Enola Gay" plays as bombs fall. Folman's own long-suppressed recollections of the Lebanon war were triggered by sessions with an army psychiatrist, which are required of soldiers leaving the Israeli reserves. So it's understandable that Waltz With Bashir plays as a psychological exercise as much as a political one. The movie doesn't pretend to answer all the war's lingering questions. It's only about the Israeli veterans, what they did and saw and how they lived with the memories. Empire: It’s a personal film, playing out as a kind of mystery, sparked by a bad dream. No opening shots here of rolling tanks, belching fire from their flattened heads. No thrum of propellers or burnt foliage to shock and draw us in. Instead we have a pack of snarling, red-eyed dogs, pelting through a city under an oppressive, mustard-gas sky, knocking down street furniture while mothers clutch their children in fear. As opening gambits go, this isn’t just gripping: it throttles. WaPo: "Bashir" is a thinking person's horror movie, about real horror and horrifying echoes. Parallels between the Holocaust and the massacres are pronounced, either explicitly, as in comments made by the characters, or implicitly. The arrival and departure of a train carrying Israeli soldiers at one point creates a bridge between the 1980s and the 1930s: Their parents and grandparents might have ridden other trains. In contrast to the death and suffering of those at Sabra and Shatila, of course, the troubled consciences of Folman and his friends would be banal -- if they weren't a mirror for an entire nation's guilt complex. Nightmares don't need special effects -- anyone who's woken up in a sweat knows it's not the theatrical element of a dream that wakes us. It's doubt and fear and occasionally unwanted knowledge. Folman the animated character is on a journey to something he doesn't want to know -- nor do we. And therein lies the awful truth of "Waltz With Bashir," which isn't animated because it makes things easier. Quite the contrary. It reduces us not to the status of children but to something basic and primal -- and afraid of the dark. The dark that coils around Sabra and Shatila. And around the hearts of men. The Guardian: Vivid and horrifying events leading up to the massacres are disinterred by the movie's quasi-fictional "reconstructive" procedure, somewhere between oral history and psychoanalysis. The film uses hyperreal rotoscope-animation techniques, similar to those made famous by Bob Sabiston and Richard Linklater. Live-action footage on videotape has been digitally converted into a bizarre dreamscape in which reality is resolved into something between two and three dimensions. Planes and surfaces stir and throb with colours harder, sharper, brighter than before. It looks like one long hallucination, and therefore perfect for the trauma of Folman's recovered memories. AV Club: The trouble with Bashir’s extraordinary technique is that it lacks the confrontational realism of live footage; the extreme stylization of the animation can be distancing, making it hard to relate the images to real events and people. But that’s also part of Folman’s point; he’s approaching memories that have been lost to him and memories that aren’t his, and he deliberately produces them as surreal and nightmarish, overwhelming and difficult to grasp. And yet they’re often staggeringly beautiful and personal, with a surreal subjective intensity that gets at the heart of the chaos soldiers perceive in combat. In the end, he finds few answers—his film is more impressionistic portrait and meditation on memory than serious journalistic inquiry into the South Lebanon massacre at the center of his mental block. What he finds is that human recall is treacherous, but that art and a lonely beauty can be found—or, in time, carefully created—even in the ugliest of places. 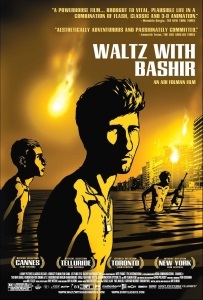 How They Did It: "Waltz With Bashir"
This is such an interesting movie. I haven't seen if for ages, but I can instantly bring the Max Richter soundtrack to mind due to its place in my playlist rotation. It could have been a documentary of talking heads and newsreels. The idea of a documentary where none of the footage from the chosen viewpoints could ever have existed so it needed to be manufactured is a really neat idea.